The global ophthalmic ultrasound systems market was valued at US$ 2731.1 Mn in 2017. 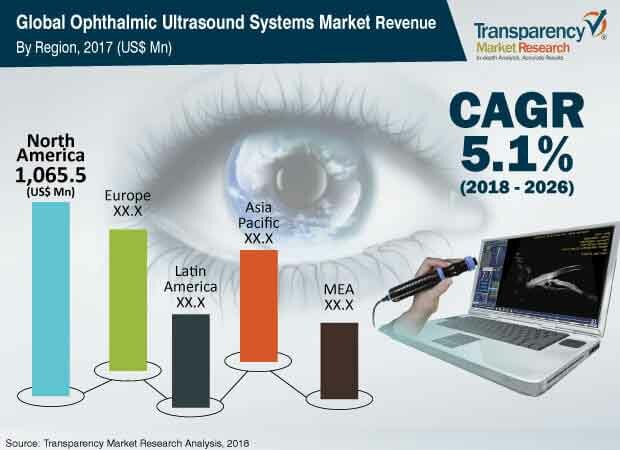 It is projected to expand at a cumulative annual growth rate (CAGR) of 5.1% from 2018 to 2026 according to a new report published by Transparency Market Research (TMR) titled “Global Ophthalmic Ultrasound Systems Market - Global Industry Analysis, Size, Share, Growth, Trends, and Forecast, 2018–2028” the report suggests that increase in prevalence of ocular disorders and diseases is estimated to boost the ophthalmic ultrasound systems market between 2018 and 2026. North America and Europe are projected to dominate the global market, owing to an increase in the demand for novel technologies. The market in Asia Pacific is projected to expand at a notable growth rate of 5.7% during the forecast period. The market for ophthalmic ultrasound systems in Latin America is likely to expand at a moderate growth rate during the forecast period. Key factors contributing to the expansion of the market in Brazil are rapid improvement in health care infrastructure and increase in purchasing power of people. Additionally, health care companies are striving to cut hospitalization costs, while offering better services to patients in the country. Persistent rise in the geriatric population significantly boosts the development of ophthalmology systems, as this population is highly susceptible to several health disorders as compared to younger people, including eye disorders. This creates a notable demand for effective management of the disorders and diseases, globally. In 2018, according to World Health Organization (WHO) projections, global geriatric population is anticipated to reach about 1.5 billion by 2050. According to the PubMed analysis, in 2018, 4.8 billion people are likely to be nearsighted by the year 2050, globally. Few common ocular disorders that exhibit high incidence rates worldwide are cataract, glaucoma, diabetic retinopathy, and refractive errors. In 2017, according to PubMed research, it was revealed that glaucoma was the second most common cause of blindness and irreversible blindness worldwide. It estimated 6.2 million people are likely to be bilaterally blind from open-angle glaucoma by 2022. A-scan was a prominent segment of the market in 2017. However, the A-scan segment is expected to expand at a CAGR of 5.4% during the forecast period. Technological advancements in ophthalmic ultrasound systems and increase in number of patients with ocular diseases and disorders drive the market globally. Portable ophthalmic ultrasound systems are easy to handle and reliably fit into small spaces. Increase in cataract and glaucoma cases in under-developed regions is also likely to boost the portable segment of the global ophthalmic ultrasound systems market by 2026. Asia Pacific accounted for a key share of the global ophthalmic ultrasound systems market in 2017. It is likely to gain market share by the end of 2026. High adoption of combined scan systems and government initiatives to promote innovative device have contributed to the significant share held by this region in the global ophthalmic ultrasound systems market. Asia Pacific is projected to be a highly attractive market for ophthalmic ultrasound systems during the forecast period. The market in Asia Pacific is projected expand at a high CAGR of over 5.7% during the forecast period, due to a large number of eye disease patients in the region. China accounted for the second-largest share of the market in the region, in term of revenue. Market in Latin America and Middle East & Africa is anticipated to expand at a moderate growth rate during the forecast period. Key trend of acquisition and collaboration among the leading players to increase geographic presence has been observed in the last few years. The report also provide profiles of leading players operating in global ophthalmic ultrasound systems market. Ametek, Inc., Carl Zeiss Meditec AG, Halma plc, NIDEK CO., LTD., Ellex Medical Lasers Ltd., Quantel Medical (Lumibird), Optos plc (Nikon Corporation), Escalon Medical Corp., Appasamy Associates, and Micro Medical Devices, Inc. accounted for a major share of the global ophthalmic ultrasound systems market in 2017. Companies operating in the market are aiming to increase their geographic presence by means of strategic acquisitions and collaborations with leading players in respective domains and geographies. In June 2018, Quantel Medical announced the opening of its new subsidiary, Quantel Medical Polska, in Poland. The subsidy is expected to strengthen the company’s position in the market in the country.